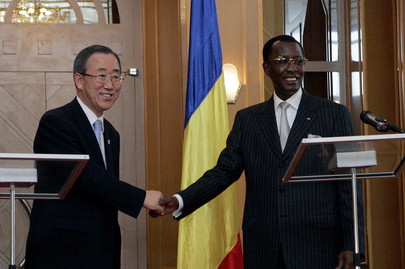 UNITED NATIONS, December 19 -- As in Chad a European Union peacekeeping mission is slated to be passed off to the UN, the government of Idriss Deby is charging high landing fees for the planes and helicopters of the mission, effectively grounding them. This was disclosed by the representative of Austria at a meeting of Troop Contributing Countries at the UN in New York on Friday. The UN's response was that Under Secretary General for Field Support Malcorra has contacted the mission about the fees, in advance of the UN's Office of Legal Affairs ruling on their permissibility. Some ask, why hasn't the complaining about Chad's imposition of these fees been as loud as complaints against Sudan? At the meeting the representative of France, Chad's main backer, said nothing about the fees, but rather asked about Russia's commitment of helicopters. In response the UN said that Uruguay has offered two Med-evac helicopters, and Poland has offered three. Some ask, why weren't these offered to the UN Peacekeeping Mission in Darfur, Sudan (UNAMID)? More generally, as outgoing South African Ambassador Dumisani Kumalo put it on December 18, the problems will only be solved if pressure is brought to bear on both parties, not only Sudan but also Chad. Friday's quiet complaint seem like part of the problem. Nepal wanted to know if it could contribute police as well as troops, but was told that "MINURCAT is a Francophone mission," since the police will be training Chadians one-on-one. Nepal recently announced that 175 soldiers and officers up to the rank of colonel will be precluded from serving as UN peacekeepers due to their involvement in disappearances. But when the UN's High Commissioner for Human Right Navy Pillay was last in New York, and Inner City Press asked her about abuse by peacekeepers, she said her Office had blocked service by generals from Nepal. When Inner City Press asked her staff in New York for more information, the response was that an answer would be sought from her. None being provided, Inner City Press on December 18 asked the Office of Ban Ki-moon's Spokesperson, who said to ask the Department of Peacekeeping Operations. But it's High Commission of Human Rights Navy Pillay's claim that is being asked about. USG Malcorra earlier on Friday told the Security Council that perhaps 59% of UNAMID will be deployed by the end of 2008. As she came out of the Council accompanied by Peacekeeping chief Alain Leroy, Inner City Press asked about the shortfall. (Sudan's Ambassador had told Inner City Press the UN's goals were unrealistic.) Ms. Malcorra insisted that more the 60% of the soldiers will be deployed, while less than 60% of the police. But we're getting there, she said. How Chad will respond about the landing fees remains to be seen. Watch this site. Footnote: there is talk of the U.S. preparing a detailed draft Security Council resolution for a UN peacekeeping force for Somalia, which might be considered in the days before Christmas or after. A Council source tells Inner City Press that, as in this week's Contact Group meeting, the rift is between the US and UK -- and reality.